I visited many museums and galleries during my stay in Helsinki including: the Atemeun, Kiasma, HAM, the Design Museum, EMMA and Taidehalli. I visited some of these, once, some twice and others three times or more. I enjoy going around the entire gallery on my first visit. This allows me to see all the exhibits, before I return to focus on what interests me the most. The works of art are a feast for my eyes and my brain, with all the different styles, old and new. Churches were also on the menu... there are so many to see. In particular the church that is built into the rock was one of my favourites. Also the organ, where once upon I had gone for a job interview to be an organ restorer! Although unsuccessful, it allowed me to follow a different path which brought me to Finland! Helsinki's buildings and wide streets are a delight. Everywhere you look, the building tower with grandeur above me. On one occasion, while visiting the Design Museum, I was in awe at the architecture on route but it was also interesting to note the amazing structures that were only noticed on my return journey. Its very hard to pick a favourite... to narrow it down to one. In my mind I have so many favourites. The graffiti artist 'EGS' took my imagination. His work had the whole museum lined wall to wall. One wall he had sprayed consisted of being thirty feet tall and fifty feet wide. He had done this work anonymously and subsequently he was not at the opening night. A world map, that would not have fitted on EMMA's huge lift. Time.... How I wish there was more of it.... to explore Helsinki. Such great design; I love you; I miss you. Its Thursday night in Helsinki. The temperature is -12C but not from my comfortable room where I am writing this post. I don't even know how to start... How will I ever be able to summarise the amazing experience that was my work placement? Actually, I do... I will start from the beginning. My first week in Helsinki was tiring and exciting. Everything was new: the buildings, the language, the food... but everything was also familiar! I grew up in a big city and I am very used to taking subways, commuting to work, the rush hour and countless queues at lunch time. So, as I had suspected, I adapted pretty fast to the new surroundings. To make life even sweeter, my workplace was a dream come true. I have learned so much from the girls at the Comic Society this past three weeks. They gave me interesting and creative assignments to do, and I had to draw for countless afternoons without stop. I loved it. It felt like home. I realised what I like to do, that is to draw comics, and also what was pulling me back from it. It was almost as if I had freed myself from my own doubts and uncertainties. The word I would use to describe week two was: 'busy'. I did not have time to be a tourist as I was too busy working. At that time I had piles of responsibilities, some of them with a very short deadline. Again... drawing, drawing and more drawing (and a bit of software editing also for good measure!). However, even though I was busy, I was able to strengthen my relations with the people I have been working with and my fellow colleagues at GTI. It is surprising to see how much we could rely on each other because we were all sharing the same difficulties. I got to learn a bit from everyones journeys. How different and fascinating they all have been. Finally my third week, which is coming to an end. I had visited most of the museums I wanted to see and by now I have delivered all my assignments and my final task is to help the teachers on Saturday with their children's comic workshop. I feel 'divided' and I guess this is the word of the week. As much as I don't want to leave because I have identified myself so much with this city, I miss home. I know I cannot run away from my college responsibilities and that my heart is in Ireland. This journey has also allowed me to reflect on my journey up to this point also. It's Thursday night, its only two more days until my flight back to Ireland and I only have to thank everyone involved in making this experience so meaningful for me. I have learned so much about myself and my art, that the question is not about how to start anymore. It is how to...never forget. This week I was lucky to be in the woodwork department under the guidance of Zeppo, the carpentry teacher. Talking to his students I learned he is highly respected and the woodwork department is very well equipped with all the tools and machines you would need. They also supply the wood. There are some interesting and exciting projects at this fantastic school. Zeppo told me I could make something during my stay and it was an exciting project. Initially I was nervous and a little unsure what was expected of me, and not knowing the language I was out of my comfort zone a little. The students were also a great help, and I am grateful to everyone for their guidance. Some of the conversations were lost in translation as I don't think that they have heard many Scottish accents before! A Japanese influenced table lamp was my project of choice. I used burnt ash with a wood veneer for a light shade, five ply/layers. These consisted of three wood and two plastic layers. I used some high tech machinery in the construction of the lamp, whilst also utilising some old Japanese pull saws and extra hard Japanese chisels and other interesting techniques I had not seen before. Overall I learned a lot through the course of making the piece. The methods I learned at Varia will serve me well going forward. I am delighted with the end product especially the difference in colour between the dark ash and light coloured shade, they really contrast and make for an interesting lamp. ​Thank you very much Varia and respect to Zeppo. Today we were taking a trip to Tallinn, although we nearly messing up, as we arrived at the wrong harbour! We caught a taxi and luckily we made it with lots of time to spare. The trip to Tallinn in Estonia was magical as the ferry glided across a frozen sea. We were surprised at the prices compared to Finland. On arriving, we enjoyed drinking coffee and sketching St. Nicholas church. We had no big plans, no buses to catch, no rushing.... just a day off to wander and explore, and maybe even get lost. We didn't have to walk far until we entered St Nicholas's which is now a museum. We were luck with our timing, as our visit took in an organ recital. The three of us sitting on a church pew drawing the same view with three totally different results. We were advised to visit the three dragons for food and it resulted in us stepping back in time to another world. The old town is one of the best preserved medieval cities in Europe. Cartoony or 'comic-esque' were my impressions of Tallinn, where we met some very nice and generous people. This morning we went to Suomenlinna. Suomenlinna is an old 18th century fortress off the coast of Helsinki. Its spread across 6 islands, although one or two of them are shut until Summer. On our way to the ferry we passed by the Cathedral and took in the views from there. The ferry out was quick, only taking 15/20 minutes. The island had some great architecture and old war time relics. In the evening we went to a hockey game. The music and lights made the whole thing feel more like a concert than a match. I still don’t fully understand the rules, and I couldn’t tell you who was playing, but the atmosphere was fantastic. café a silver pot arrives containing silver needle tea which costs €8.50 and is poured into a fur-lined cup by Meret Oppenheim. 'Nobody will give you freedom', she says, 'You have to take it'. I pick up a pencil, open my notebook and fail to create anything. Which is more important, I wonder? To draw a picture in a notebook or to make a teacup unusable? The question troubles me in so many different ways that I finally decide it might actually be time to do some work. 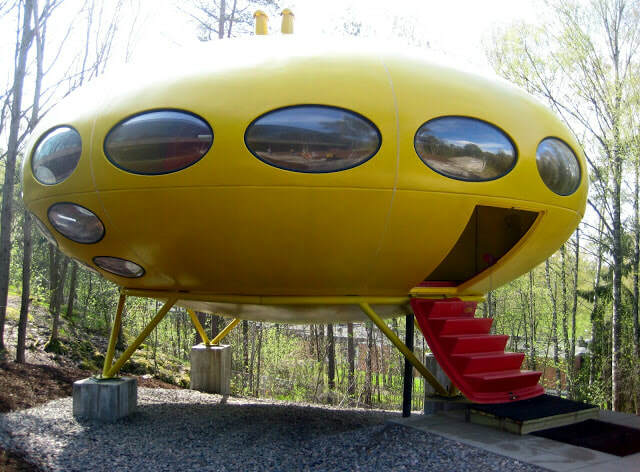 I climb into the Futuro (image above) and settle myself down for the flight across the city. Imagine that the Futuro was designed when people were innocent enough to believe that the future would involve plastic-silver clothing and meals in pill form! I look down over Uspenski cathedral and Helsinki cathedral. Earlier I sat in Kallio church and listened to a man fill up the rafters with divine whistling. When the Futuro lands I quickly check behind the pine trees for terrorists, then dash inside to safety. What a relief it is to reach the utopian, snow-bound world of EMMA. Behind its 'Brutalism' inspired walls, are people of such kindness, warmth and good humour that it feels very good to be back. Meret somehow managed to get here before me and is upstairs covering vast spaces with her surreal images and ideas. I attempt to keep busy by doing some archiving in a quiet office, but I’m not very good at it so I go and stand beside Meret as she works. Downstairs a tall blond man in a glittering jumper is designing beautiful clothes out of paper, and staff are disappearing behind moving walls and secret doors. Meret, I say, sometimes I think art is dead as soon as it’s been made, and art galleries are really mausoleums. Surely there’s more to learn about art outside in the forests or on busy streets? The snow is slowly melting in Helsinki. The white landscape and streets are giving space to greyish mud and lots of ice. It's getting tricky to walk around since the ice makes everything very slippery and it's really hard to see the frozen paths. There's also warning signs all over town about the falling ice from the rooftops. I guess that's the way it works here, people here don't bother or worry too much....but for me, extra care walking around is totally needed. I have finished designing a poster for the Children Workshop in February, and today my task was delivering it around town, specifically at the libraries and comic shops. It was great to see parts of the city I've never been and to see my art attached on the walls of Finnish buildings. It is just a small poster but meant a lot to me. Happy Chinese new year everybody. A busy day in the comics centre and falling snow.. I believe Helsinki makes people feel this way. It is so easy to get around: the buses, trains and trams are all connected by an app called Reittiopas, which is user friendly and there's also free WiFi all over the city. It's so welcoming to be here, not only by the people who are great and very friendly but by the city and the way it was planned. My week began with lots of responsibilities. Last week I was asked to create a poster for the next months workshop, but now I am in charge of making this months one too, which is fantastic because I get to plan, draw and paint. The comics society is being a great place to learn about comics and it is very inspiring. I have been drawing comic stripes almost every day and I know I won't stop anytime soon. And just to top up my wonderful creative day, it's snowing all day, it makes the most beautiful scenery. Q: Teppo, what's that word Robin told me yesterday that describes Emma, the unfinished look where we can see the wood grain from shuttering joinery that was used in construction? Myself and Pasi, who is a sculptor, we affixed plexi-glass to the display cabinets and walls of which I had been working on beforehand. Up close with the artwork at this stage, what more could I ask for. Getting familiar with EMMA, where things are situated... it's an interesting place to work. However, I have not made it past the Optical art section in the main gallery due to being so busy. The museum was extra busy today... buzzing. There was a TV crew visiting and there was much excitement about. I came across Jenni - the conservator who was working with a laser level, and was curious as to her approach. Q: What is the middle height for artworks on the wall. A: It is 150 cm, It suits adults and children alike and I am the perfect height for viewing at that height. I had said to Tiina its too low for me and I need to get on my knees to read it! She replied I am too long. Afterwards, I went to find my classmate Sadhbh to show her this technique. Salla- the collection assistant, offered me to show me a packing crate getting opened. This was something that had been prearranged with Sadhbh also. She took us both to see Marianne- the collection conservator. It was a piece by Oscar Furbanacken. I was very interested in the LED's used and their temperature on the kelvin scale. It looked like a concrete block but we never got to see it plugged in unfortunately. We were then asked if we had any more questions... I had many. Q: Why is no flash photography allowed in the gallery? Sami the set production manager, specalist in conservation on art. A: It has to do with Lux the maximum for paper is 50 and 200 for others, we say no flash photography for all instead of individually. All excess light is dangerous and degrading and we position paper works away from the windows. Some are on loan from three months up to two years, some museums wont loan out for more than three months for this reason. Q: What are these orange things Robin (pictured)? Robin the artist who works at various museums. A: They are for transporting paintings, the transportation of crates. My first job today was to clear and clean the cinema room. I used a vacuum cleaner that would put henry to shame! Next was helping with the projector. Changing the aspect ratio from cinematic to 4:3, next was asking questions and painting. In between waiting for paint to dry to coat a second layer, I was helping Teppo the architect who designed the set. We were erecting frames which I helped build earlier in the week, for the Meret Openhein exhibition opening Tuesday. All in all, a very busy day where I was glad to lend a hand and get educated along the way.